What is white balance? White balance is an adjustment of all the colours in a photograph to present the correct colour white. But white is white? Right? All types of light give off different colour temperatures that are not visible to the naked eye. White balance adjusts the camera for these different types of light. Sunlight gives off a much different colour to an interior fluorescent light. 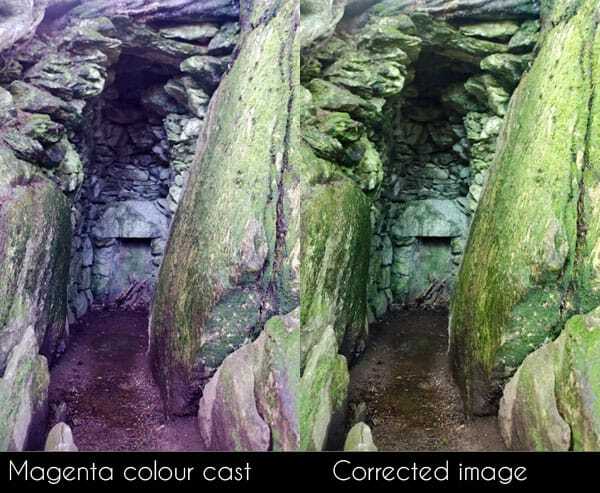 By correcting white balance either in camera or on the computer, we are able to get a more accurate rendering of the correct image colours. Why is white balance important? White balance is an often overlooked, but important step in photography. It’s important because it affects the colour tones of your photo. You don’t want your portrait to come out orange or your waterfall with a magenta tint. Subtle adjustments of white balance allow you to also create a mood in the image. White balance in Lightroom goes in four colour directions. What is that enormous number next to your settings? That’s the colour temperature in Kelvins. See below for the effects of the different settings on this image of the London Eye. These colour effects are reversed when shooting indoors with electric lighting. The below photo was shot at night in a restaurant with a mix of fluoro and tungsten lighting. See the difference between this and the outdoor settings, which look incredibly yellow. Sometimes images can get a magenta or green colour cast. I find the magenta cast appears most when shooting very green places, such as glades, forests or waterfalls. See this picture of a cave in Ireland, which was incredibly magenta. I adjusted the image by bringing down the magenta levels. Much better! Please note you can only adjust the white balance on these settings if you shoot in RAW, otherwise your options are limited to Auto, In Camera or Custom. So how do I fix my white balance? Most DSLRs with manual functions will allow you to set the white balance. Check your manual for more info on where, but usually there’s a big fat button that says WB. Scroll through the icons until you get to one that represents your lighting conditions. They’re pretty standard icons; sun is for sunshine, the cloud is for cloudy and the light bulb is for tungsten. The second option is to set your white balance using a white balance sheet (or even a blank piece of paper). By using the in camera white balance settings, you can tell your camera what it should view as white. If you shoot film, pick film brands that are good for the type of light you’ll be shooting. Kodak is much warmer and Fuji has cooler green colour tones. Changing the white balance in Lightroom couldn’t be simpler. Just click on the eyedropper tool at the top of your right hand menu and click on a neutral colour (usually white or grey) in your image. If you hover over the colour, you can see a preview in the top left of how your image will look. You can also adjust the white balance manually by sliding the sliders up and down. Have a play to get a feel for how the sliders change the image. A more advanced technique is to do multiple white balances in the one image using the graduated filter in Lightroom… but that’s another tutorial!